OK the controls might be too difficult to master. There is 35 moves Knack can learn throughout the game. You need to use different attacks on different types of enemies. Like if there is a dude with a shield you can’t use hook to grab him until you have destoryed his shield first. Then there is enemies that are very agile and shoots you with different kinds of things like knifes and you need to block the attacks with your shield. If you manage to hit the shield button correctly then you’ll shoot the knife back at the enemy but this might be difficult since you can’t always be at right angle to see when the shot item has reached the right spot to be shot back. Let’s talk about the camera… yes it is there but you can’t move it AT ALL. Every camera angle is decided for you. Instinctively I tried many times to move the right stick of the controller but only to find out that Knack use a dodge move by that. I did this million times since sometimes I wanted to change the camera angle. Overall the pre—set camera angles are good. There might be couple places where you’d wish to change it. I don’t remember how it was in Knack 1, but this review is about Knack 2 so let’s try to focus on this game instead. Knack 2 contains QTE but it is not like Resident Evil 6 that you have fraction of a second time to react. It is more like a beautiful cutscene that you can interact. Like in the 1 you can and you have to change Knack in the small size — his original size. Yes, he is a tiny thingy made from mysterious old relics. If he collects more of these relics he can grow bigger. Huge. Then he’ll have more power and he is stronger and can kill enemies faster. But there’s also big enemies so sometimes it is equal fight. First of all I have to say wow! The graphics are simple like there isn’t as much detail as is in many other games but in this game the detail is enough. I played with PS4 Pro, 4K and HDR on so that’s why I said wow! It is beautiful game overall. Detail is just enought to bring everything to alive, but still I would’ve personally liked little bit more detail. I don’t know how the game looks in PS4 1080p non—HDR TV’s but I can imagine it looks great anyways. 4K HDR are just extra. There wasn’t any glitches or bugs that ruined my gameplay, but shortly; it is beautiful game. Story starts of a young man telling story of his life and how they saved their city called Newheaven. He also tells about a professor who managed to create Knack from the mysterious relics which also gives power to the city. But the city is being attacked by robots and then gameplay starts and you need to save the city… by violence!! Who is attacking and why?! The answer is that there is bad goblins who try take over the world by awakening ancient robots and destroying everything. And this is our quest and we gonna stop it by any means. The plot overall is kinda boring. In the very beginning it is exciting but it fades away quickly and there should’ve been more of the story in details and cutscenes. But without it the story sems kinda boring. I quickly forgot what I was doing and why. Why am I jumping over these moving obstacles again? You see what I mean. There is couple places where by going and doing whatever you need to do it seems kinda pointless if we look the storyline in overall. So couple times I was dissapointed and frustrated how much effort I needed to do to gain nothing. The plot is very much for kids so as an adult gamer why I need to complain, but I review games and this is my opinion anyways. The story is not bad it’s just lackluster. About this I have lot to say. First of all there is 34—35 moves you can learn throughout the game. You collect very valuable blue energy that can be used to upgrade Knack’s moves. There is so many moves to be learned so quickly that many of them have completely forgotten already. I think there is too many moves, they should’ve cut it at least to 10—15 moves, but 35!! You actually have to learn at least some of the moves since they’ll be used at certain enemies. You can beat them more easily, but when there is 10 different types of enemies coming at you, you just instinctively try to smash the buttons for basic attacks so you mostly use the basic moves, but when there is only couple of enemies you can calculate what to do and then use those precious moves you have learned. In options you can find all the info you need. Every move is explained there with visual preview. Even with this I forgot lots of moves that actually would’ve helped me in my journey but hey… 35! I don’t know what genre this game really is? It reminds me of Uncharted—Mario—Final Fantasy. You can upgrade things like in some older Final Fantasy games and you’ll have to jump and move like a Super Mario and the linear gameplay with little bit or large areas like early Uncharted games. But I learned that it is platform so I lean more towards Super Mario. I played this game in Normal difficulty and I found it to be decent. Not too hard not too easy, but I died alot in some fighting situations when two enemies is shooting at me in a distance and some super fast and strong robots attacking at the same time. My advice is that take over those shooters first no matter what the situation is and then take care of the other enemies. Those shooters will only make you go down and take hit after hit and other enemies attacking at the same time it’s recipe of death. Usually when there is lots of enemies there is also a huge stone that after you break it you gain super powers for a limited time and you beat the enemies with an ease. Along with the blue energy you can collect sun stones that’ll give you a shield that lasts certain amount of attacks before your life gauge is going to run down by the hits you take. You should always collect these when you see them around you. Knack is actually a small old NES Super Mario—like creature built of little kid’s toy—like blocks. In this normal form he is tiny and can’t do much things and attacking enemies is pointless. But he can do all sorts of different things like go through small gaps and especially go in small secret places where you open a chest and find a treasure from there. I don’t know what all things you can find there but I found parts, some water and fire stones that have to be collected 20 to be used as ?. I didn’t collect enough in my gameplay so I don’t know of sure what they’ll do. But foremost you collect parts that can be used to build some gadgets for Knack. I got gadget that brings me back where I was before falling in my death. I have no idea what all gadgets you can get but I got this one. The camera is static. I tried million times to move my right joystick but only to find out that Knack makes a dodge move with that so you CAN’T move it AT ALL! This is good and bad thing. 98% the camera is in right position and don’t need to be changed but there is 2% of times where I needed to see what is there more accurately but I couldn’t. Like how close the deadly lazer is ‘coz the perspective was off. The gameplay is mostly just jumping over moving obstacles like in old Super Mario games and finding crystals and relics and then fighting with bunch of enemies and moving forward to see a small cutscene and doing it all over again. So the game is very repetitive and it becomes very obvious in the beginning already. But somehow it feels nostalgic and the old platforming is strongly available in this game. It is easy to move Knack and basic moves are easy to remember. It is overall nice gaming until there’s too many moves to be memorize. Gameplay is smooth 60fps 4K HDR. That was beautiful sentence. And I didn’t find any lagging or fps drops (or maybe there was technically but my eyes didn’t notice) and it was beautiful and smooth. I think they managed to do this by reducing the detail in graphics? In options there is option for locked 30fps and I think it is for PS4 players, so I don’t have much to say about that since I played this on Pro. There are puzzles in this repetitive game. The puzzles are not difficult they are actually pretty easy. Not like Uncharted has but reminds me of that somehow. I don’t know if it’s a good thing when they are easy or not? I’m kinda baffled. This game is for kids that’s for sure so maybe they are logically not too complicated. Areas of this game are variable. I liked that it gave new breath and feeling of “I wanna see more of this new area”. But it fell short quickly when I learned that basically it is one and same thing if I’m here or there, the things I needed to do was repetitive. One thing that kept me going was the upgrades that I wanted to collect and find those secret rooms with a chest that would give me new parts or something else nice. Co—op is also available in this game. I don’t know for sure what this means since I usually don’t play online games. I tried it and found out it is local co—op and like I have said before I don’t have any friends. Any. So I have nothing to say about it. But what I believe what it is, is that simply someone is helping you out. That’s all. Sooooo…. I really don’t know about the difficultiness of this game since it is my own fault that I didn’t learn all the 25 moves I got my playthrough? Even Nioh doesn’t have this complex moves. So…? Let put it this way if there would’ve been less of annoying enemies and parts when 5 different kinds of enemies, which need their own move to be killed, attacking me at same time, then this game would’ve been more joyable and not that “annoyingly difficult” even in Normal difficulty. There is more difficulty modes and I don’t even want to try them, but if you like a challenge then go for it. So this game is not basically difficult if you are quick from your mind and fingers and you can remember lot of moves fast. But for casual players you should go on Easy mode straight away. The technical part of this game is in right shape but the content is lackluster. 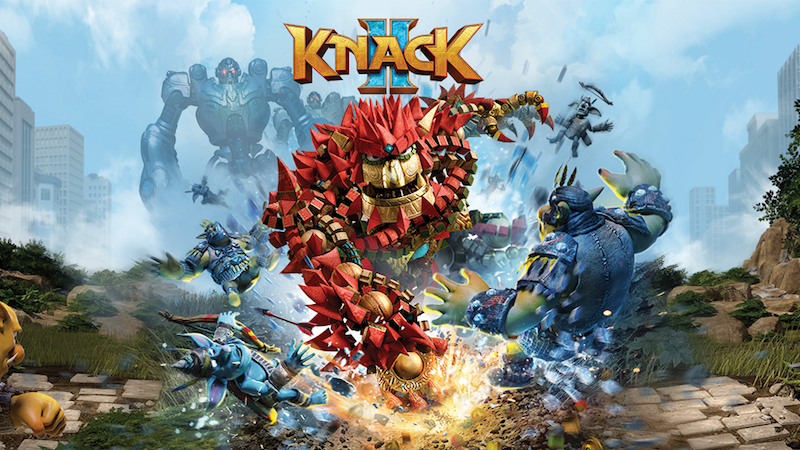 It is shame because this could’ve been so much better if they would’ve been made Knack 2 with different aspect, but they didn’t. Eventhought all of this I actually enjoyed this game so much because it reminded me of old Mario games at times. But that doesn’t save the fact that you need to memorize 35 moves. It is simply too much! Okay… I have calmed down now. You can put the gun away. My very last impression of this game is B— simply because the repetitiveness and lackluster content. That’s all. Yet again; with all said above and price tag of 39.9something € this game is actually very cheap. It is made from a guy who made PS4 Pro so it must mean something. The technical part of this game is top notch but content not so much. This game is almost AAA—title, lets say ABB—title and usually those kind of games cost like 70€. This is cheap so if you enjoy platform games, action and little bit of RPG you must get this to your collection. One more level? Not so much. I don’t know what genre this game really is? It reminds me of Uncharted—Mario—Final Fantasy. bit or large areas like early Uncharted games.